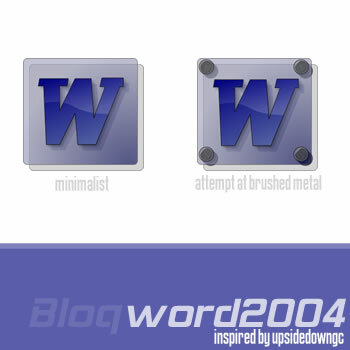 Microsoft Word 2004 in the bloq style. Contains two versions, one without the corner posts. Inspired by UpsidedownGC's piece: Link . Remade with permission. (You know what you need to do to make it usable as an email address) and I will send you an email with permission so that no one asks questions regarding permission. Make sure the subject is not in all caps and includes the phrase WinCustomize so that it goes through my spam filter. Thanks! One more question. Did you dop this in Fireworks or another program and if you did it in Fireworks how did you get to be an uneditable PNG? after you've made your icon, all, and go modify > convert to bitmap. make sure you saved the original first! save the single bmp under a different name - still as a .png though. Looks really great man, real clean . You should consider doing an entire office series, it would be awesome. I am going to try to create something that goes with my intnetion for the other office suites and then let auto-logic see what he wants to do iwth it. Anyways I do think this might be the best remake available for download. the whole office suite is in progress. once i get some time! hey, upsidedowngc your work isnt "bad" - everyone must start somewhere. take a look at my early stuff, it's not that great. but i would like to see what you've got in mind for your office version. Hey auto-logic give me your e-mail address and I will send you my icons that I am making. THey have the powerpoint, word and I am working on the excel part right now.